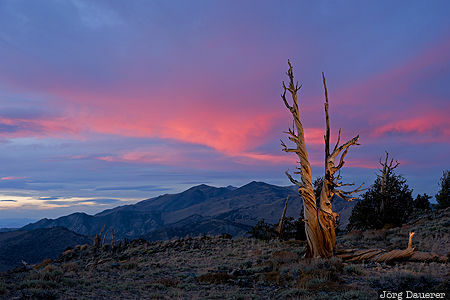 A spectacular sunset behind a lone Bristlecone Pine in Ancient Bristlecone Pine Forest. The tree was illuminated by a remote controlled flash gun (fill flash). Ancient Bristlecone Pine Forest is in the east of California, United States. This photo was taken in the evening of a cloudy day in October of 2016. This photo was the image of the month in March of 2018. This photo was taken with a digital camera.